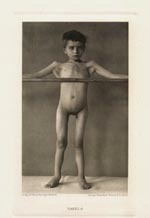 Dystrophia muscularis progressiva infantilis. (involvement of the face. without pseudohypertrophy). Continual progression, up to the time of the photographic session, of a very pervasive condition. The atrophy affects the greater proportion of the musculature, and particularly the muscles of the face. Plates 5,6 and 7 show the case from various sides, while plate 4 gives the entire frontal view of a relaxed pose. 9 year old boy. Most probably not genetic. Parents and siblings allegedly healthy. Start of the malady before 2 1/2 years. Plate 4 shows from the front the characteristic demeanor of the face (facies myopathique): rigid, mask encased expression, somewhat drooping lower lip. Eyelids open wide (cannot become perfectly closed). At the neck one sees hardly more than a suggestion of the sternokleidomastoidei. Their loss is rare for this sickness as it is known. The mm. pectoral major and minor are almost entirely diminished. Because of this as well as because of the atrophy of the entire musculature of the shoulder yoke, the arms hang slack downward. Under equal force, the clavicles appear drawn down, such that their acromial ends set deeply while the sternals protrude forcefully under the skin. Another accurate indication of the loss of the pectoral muscles and of the abnormal tendency of the clavicles are the deep skin folds that form from the forward edge of the armpits pulling up over and inside. The lower portions of the Thorax are broadened and oblate in the more familiar manner. The high grade atrophic musculature of the upper arms is evident, while the forearm and hands appear unchanged and in addition have suffered none whatsoever of the loss of strength and efficiency in their function. In the legs, the photograph shows particularly clearly the atrophy of the femoral adductors, on the whole much more severely diminished with the muscles of the left femoral than those of the right. Lower leg and foot muscles, like those of the forearms, normal. 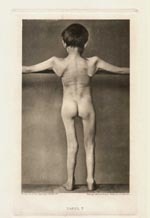 With Plate 5 comes firstly the considerable lordotic forward curvature of the pelvic vertebrates (kyphosis), relating to the atrophy of the waist and back ligaments, and then the wing shaped protuberance of the shoulder blades (high grade serratus-atrophy) of the atrophy of the deltoids, triceps and the scapular muscles particularly of the intraspinatus, as well as the gap between both thighs, again caused by the loss of the adductors. Plates 6 and 7 specifically show the whole terribly passive motility of the shoulder blades as a consequence of the pervasive atrophy of the appurtenant muscles (slack shoulders). In Figure 6 one observes further atrophy of the pectorals, made especially clear by the pose chosen for the arms, and a view shot of the face shows, at least as clearly as in plate 4, the flabbiness of the lines, the swagging of the lower eye lids, the puffing of the upper lips. Plate 7 unsettles still more, especially by way of the skeletal appearance of the backbones which, as a consequence of the nearly entire loss of the back thoracic muscles, one can see and track the thicket of individual ribs up the spine.